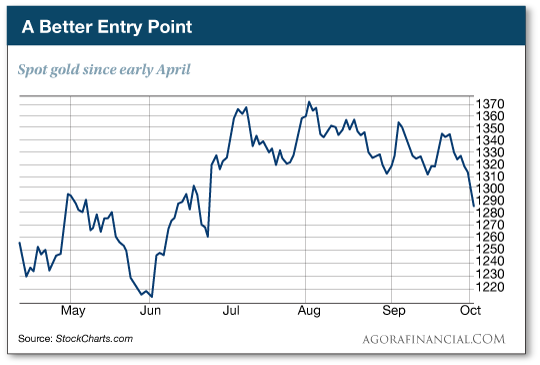 Gold gets whacked: A terrible blow… or a better entry point? The fine print of insurance policies for cash… the Galactic Monetary Fund… an “October Surprise” in Iraq… and more! Well, that’s ugly. Gold is down more than 2% as we write. The $1,300 level is history for now. At last check, the bid was $1,284. No, there’s no obvious catalyst. The free fall began the moment the Comex opened in New York this morning. It’s not as if hot money is flooding into stocks and bonds, either. The dollar? It’s strengthening, but not dramatically; the dollar index is up about two-thirds of a percent, at 96.4. One Federal Reserve pooh-bah gave a speech this morning, but not one of the heavy hitters. Too, the Midas metal is still up more than $200 from its lows at the end of last year. It’s at this moment we feel compelled to remind you of something we mentioned last week, spurred on by a reader’s inquiry: An interest rate increase by the Fed in December doesn’t mean the death knell for gold. The mainstream logic, such as it is, goes like this: The Fed will move to raise rates at the first hint of inflation. Once that happens, investors will sell gold and buy Treasury notes to grab the rising yield. But that’s not what happened when the Fed executed its one and only post-Panic of 2008 rate increase last December: The 10-year Treasury yield fell from 2.2% to today’s 1.6%. And gold bottomed at $1,050. It’s up 22% since, even accounting for today’s drop. We bring up that reminder about a December rate increase for this reason: Jim Rickards says you can count on it. “In the midsummer of 2015,” Jim continues, “the Fed started a hawkish cycle to prepare markets for liftoff at the September 2015 FOMC meeting. To the Fed’s surprise, the Chinese reacted defensively to the stronger dollar by breaking their currency peg to the dollar. This caused the stock market to crash over 10% in the next three weeks. 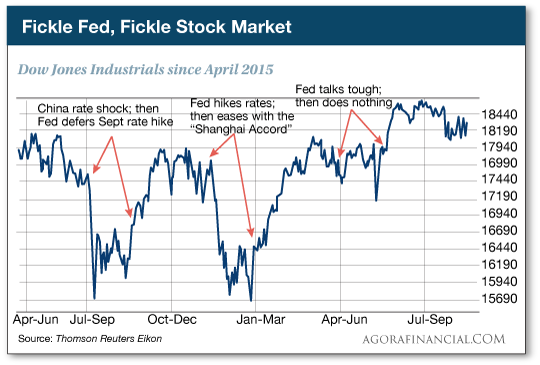 “By mid-September, the Fed had to switch to dovish indications to rescue the stock market. Any hope of a September liftoff in rates was abandoned. Then the stock market rallied back on the easy-money signals. “With the all-clear from markets, the Fed actually did achieve liftoff in December 2015. This led promptly to an 11% crash in stocks from Jan. 1 to Feb. 10, 2016. Once again, the Fed had to switch from hawkish to dovish (this time via the Shanghai Accord on Feb. 26, 2016). Once again, stocks rallied back on the promise of easy money. “If the Fed hikes in December, which we do expect, it will repeat the blunder of December 2015 almost a year to the day,” Jim says. The job numbers of late — phony as they are — give the Fed space to raise rates as it wants. “But,” Jim explains, “the Fed does not want to cause a market meltdown or trigger a recession in the process of raising rates. In order to manage this gracefully, the Fed looks at market expectations of a rate hike. If expectations are high, the Fed takes the view that it can raise rates without upsetting markets. “The problem in June, July and September was that markets did not believe the Fed tough talk. Fed funds futures (a good barometer of market expectations) gave a low probability to Fed action. “Now it’s different. Markets are giving the probability of a rate hike in December an almost 60% chance of happening. The Fed will try to talk that up to 80% or higher by early December. Once labor market strength and futures market expectations are aligned in favor of a rate hike, the Fed will move. As mentioned moments ago, stocks and bonds look lackluster. The major U.S. stock indexes are flat as we write, after ending yesterday with a modest drop. Treasury yields continue to inch up, the 10-year now 1.66%. Crude prices are steady, a barrel of West Texas Intermediate fetching $48.88. Alas, gold’s drop continues apace. At last check, the bid was down to $1,277. And that’s despite the dollar giving up a bit of that earlier strength. For the record: The national debt grew $1.42 trillion in the fiscal year ended last Friday. The total is now $19.57 trillion. Uhhh… We’re used to the national debt growing faster in 12 months than the “official” budget deficit figure implies… but $1.42 trillion is a heck of a lot more than the $600 billion the White House and Congress were telling us about. “Every problem is also an opportunity,” says Ray Blanco of our science-and-wealth team — thinking about the big Yahoo hack disclosed last week. The federal government recently undertook a $19 billion effort to shore up the cyberdefenses of government, businesses and individuals. “The reason is easy to understand. Our information infrastructure — how we store and transmit data — is central to the function of the U.S. economy. Ray’s favorite cybersecurity names in Technology Profits Confidential include one that’s best of breed in a competitive field… and another he says “practically owns its own market niche” in preventing attacks when hackers get their hands on network accounts with powerful user privileges. “Insurance for cash!” a reader marvels after yesterday’s episode. “I just wanted to be clear in my mind on Jim’s tweet about the IMF infographic, and his claim that SDRs are backed by nothing,” a reader writes. “The graphic is saying that the SDR has a reference value based on a basket of currencies. “So for the IMF to issue 100 SDRs as a loan to another country, are they getting a deposit of those five currencies to equal 100 SDR? Since those five currencies are all fiat money, they are based on nothing, so the SDR is based on nothing but they are loaning it anyway and collecting interest. “Or are you saying the IMF is doing fractional banking, so they get one deposit of the five currencies to equal 100 SDR and then lend it out several times and collect interest? In this case, they are multiplying fiat money worth nothing by several more times and getting paid for it. “Or are you saying they never got a deposit of the five currencies — they just wrote out a loan for 100 SDR’s with nothing in the bank and someone thinks this is money and pays interest. “If that is the case, who is with me to start the GMF — Galactic Monetary Fund? Because the IMF is eventually going to print itself into obscurity, and they will need some different fiat money to bail them out. “Darn,” the reader wrote a few moments later. “I can’t start the GMF on Kickstarter. The 5: Better luck next time. Back to your question: SDRs are, as you suggest, a chimera. “The ‘basket’ is just an index for pricing SDRs,” Jim says. And rest assured in the next crisis, they’ll be issued in mass quantity, backed by thin air. Longer term, Jim foresees a time when the SDR might end up with some level of gold backing — a desperation move to restore confidence in the system, long before the Galactic Monetary Fund would have to swing into action. That’s how Jim arrives at his $10,000 gold target — taking the “M1” money supply of the United States, the eurozone and Chin, and giving it 40% gold backing. Jim has so much conviction behind this system that over the last several months he’s mailed $1.2 million in gold to readers. Real gold from the U.S. Mint, discreetly mailed to addresses across the United States. If you’ve missed out, you can lay claim to Jim’s one-of-a-kind “double gold” offer. But you need to act now. Access to this offer shuts down at midnight Thursday night. After that, this link will be dead.